Dear Lissy is a perfect fit for owner Alyssa Drake’s big-hearted love for life and people. The business offers stylish, creative wedding photography delivered with exceptional quality and care. Alyssa’s love for bringing people together goes further—in 2017 she led the way in co-creating the first-ever Central Otago wedding fair. Swimming down in pristine surrounds of the Gorge in the summer and sledding in the winter are quintessential experiences Alyssa remembers growing up at Chatto Creek. After developing an interest in photography in the sixth form at Dunstan High School, she initially pursued a career in aromatherapy and massage. Yet her passion for photography lingered, offering Alyssa a new medium for creativity and self-expression. When Alyssa’s cousin—a professional photographer—asked her to 'second shoot’ a wedding, Alyssa fell head over heels in love. “Wedding photography is so much more than simply capturing memories, its connecting with people and life itself. I think my whole passion and drive comes from a deeper sense of knowing this and really being able to embrace documenting some of life’s most cherished moments. Understanding who my clients are and what is important to them helps me in my creativity for planning their day to truly reflect their authentic personalities." Integrity is a huge part of Alyssa’s values—her word is her truth. Honesty and sincerity are touchstones for her business: people trust that what she says, she’ll do. Building positive, two-way connections with her clients is vital to business success. Building a wedding industry in Central Otago is something that truly inspired Alyssa and her friend, Sophie Chalmers. 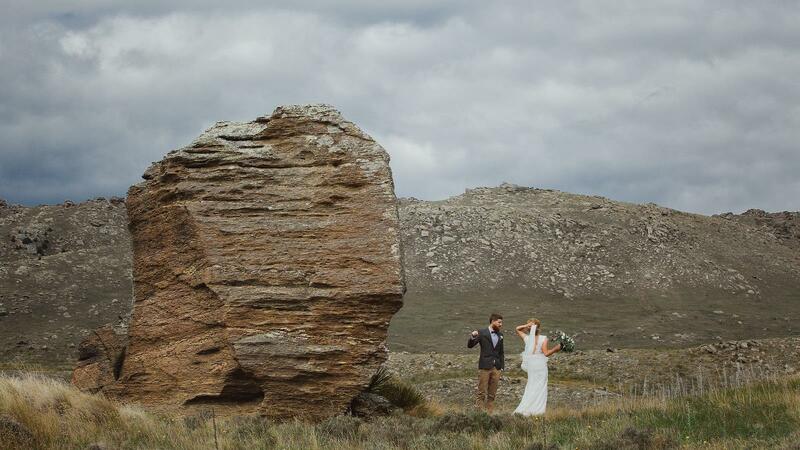 Recognising that Central Otago’s distinctive and remarkable landscapes offered a stunning canvas for a couple’s dream day, the pair organised Central Otago’s first-ever wedding fair in 2017. It was a huge success with 50 businesses taking part and 500 people attending. “Being a creative person, there was something burning in me for a long time, before I came out and said this is really what I want to do—this is what I really love, and I want to help build this in our community. I think to get great success you need great risk and believe in yourself wholeheartedly. Bringing together our amazing creatives and businesses community to create a visible platform for couples to utilise when planning their dream wedding here is incredibly satisfying." A perfectionist at heart, Alyssa prides herself on giving the best quality and service. Not only is it good for business, it’s integral to who she is, her values and the way she lives. Guiding couples through their big day is about making lasting memories that are special and wonderful. “Meeting obligations is very ingrained in me and with wedding photography it’s vitally important to a couple. So, when I meet with a couple for the first time, I love to help remove the stress of the day by drawing on my experience to help guide them through their wedding day timeline and bring their unique vision to life, allowing their day to flow effortlessly. Making sure my clients are well taken care of from the moment they get in touch is how I approach each wedding."